BOSTON, MA – RIT women's crew matched windy conditions on the Charles River at the 50th Annual Head of the Charles Regatta on October 18-19 with their own strong will, finishing seventh overall in the Women's Collegiate Eight event, their best finish in program history. The Tigers crossed the start line at bow number 26, passed several crews, and raced to a top ten finish and the first crew to represent New York State. Bates College finished first in a time of 17:25.60, followed by Trinity, Wellesley, Grand Valley, Washington College, Barry, RIT , Williams, Middlebury, and Ithaca. Rounding out the New York schools, William Smith finished 12th, West Point 18th, Rochester 19th, and St. Lawrence 25th. RIT finished in a time of 17:57.59. Representing the Tigers racing in the Happy Day, from bow to stern sat Katie Baldwin (Phelps, NY/Midlakes), Lindsey Schwartz (Rochester, NY/Gates-Chili), Taylor Blackwell (Pittsford, NY/Pittsford Sutherland), Erin Coppola (Rochester, NY/Our Lady of Mercy), Sarah Foggett (Webster, NY/Webster Schroeder), Brittany Dzugas-Smith (West Babylon, NY/Landmark), Laura Alderfer (Sellersville, PA/Pennridge ), Arielle Weinstein (Athens, NY/Coxsackie-Athens), and coxswain, Erin Loughran (Newburgh, NY/Newburgh Free Academy). Women's Varsity Coach, Cassidy Goepel commented after the race, "I'm so proud of these girls. The day before we had a terrible Charles practice row. The girls were frazzled with all the crews on the water, the stopping and starting, and near misses. But I told them the race would not be like that. Once they were on the course they would have the opportunity to let the shell run out and let it fly. And they did! As soon as they landed on the dock and I saw all their smiling faces, I knew and they knew that they had raced a really solid piece. All of the girls did well. I'm just as proud of the oarswomen in the double and the four. They raced on Saturday with just as much heart and really created a nice spirit and a lot of momentum going into Sunday." Representing RIT for the first time in the Women's Championship Doubles event were Phoebe Hurd (Raymond, ME/Windham) and Chelsea Coates (Sanborn/Niagara Wheatfield). These first time scullers took on the challenge with aplomb against some very good crews. 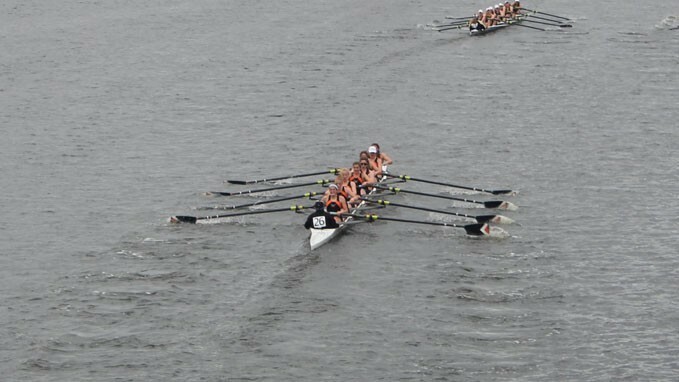 Undaunted, the Tigers met their goal to do their best and steer a good course on the winding Charles River. They finished in a time of 22:20.84 and in 22nd place. In a borrowed shell from the University of Rochester, and with only a couple of practice rows under their oars, the Tiger four finished 28th out of 36 crews in the Women's Collegiate Fours event in a time of 20:54.99. Seated from bow to stern sat coxswain Sarah White (Bay Village, OH/Bay), Jillian Bastidas (Bethlehem, PA/Notre Dame ), Hayley Bartkus(Philadelphia, PA/Central), Kalila Elahi (Rochester, NY/West Irondequoit ), and stroke, Christina DiSalvo (Derry, NH/Pinkerton Academy). The Tigers end their fall training season this weekend at the Head of the Fish Regatta in Saratoga Springs, N.Y.